3 Best Whirlpool Garbage Disposals - Should We Trust Them? Whirlpool is a company known for their long-lasting home appliances. They make everything from washing machines to garbage disposals. Their disposals, in particular, are very sturdy. This is great because installing a garbage disposal is quite a bit different than installing most other appliances. The level of plumbing knowledge involved means that you want one that will remain reliable for many years. 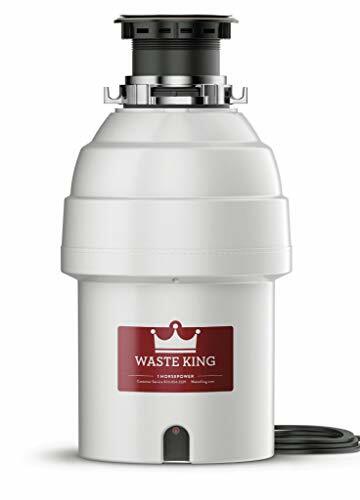 We’ll go over three of the best Whirlpool garbage disposal models here in order to make the decision a bit easier for you to make. Grinding Options – You have your choice of either a batch feed or a continuous grind disposal. A batch feed disposal is one where you place the food waste in the disposal and the insert a stopper. The stopper is what turns the machine on. A continuous grind model is the opposite. You simply flip a switch to turn it on, and then feed your food scraps into it. Noise Levels – Many garbage disposals are quite noisy. However, there are some models that promise to be much quieter than others. It’s best to seek out reviews of your favorite disposals in order to find one that isn’t too loud. Grind Stages – The amount of grind stages that a garbage disposal goes through determines just how small the ground-up food waste will be. You need the end results to be as small as possible, or else you run the risk of clogging up your pipes. Cost – Unless you’re a certified plumber (or know someone who is) you’ll have to pay for the Whirlpool garbage disposal and its installation. When looking for the best model, keep this in mind. There are disposals at many different price points, making it easy to find one that fits your budget. We reviewed all of the Whirlpool garbage disposals on the market in order to come up with a list of the best three. We’re not only listing them here, but we included a number of pros and cons, as well as a discussion of their features. Our goal is to do the legwork for you, thus saving you time. This is one of the best Whirlpool garbage disposals. It’s fairly lightweight at 12.85 pounds and is made of stainless steel. Despite this, the Whirlpool GC1000XE comes in black only. This makes it less likely that the exposed section (essentially a rubberized lip) will show any grime. This Whirlpool disposer comes with the necessary power cord and is known for being easy to install. It measures roughly 6.5 inches wide by 6.3 inches deep by 11.5 inches long. We reviewed all of the features for the Whirlpool GC1000XE. The 1/3 horsepower motor and continuous feed design on this Whirlpool model can handle any number of food waste. Speaking of which – its powerful food waste grind pulverizes your leftover dinner scraps into fine particles that easily fit down a drain. This disposer has an output of 1,725 RPM (that’s rotations per minute, for the record). It also comes with a one year manufacturer’s warranty. This disposer is very easy to install. Its continuous feed grind ensures that food waste won’t get stuck in the unit. 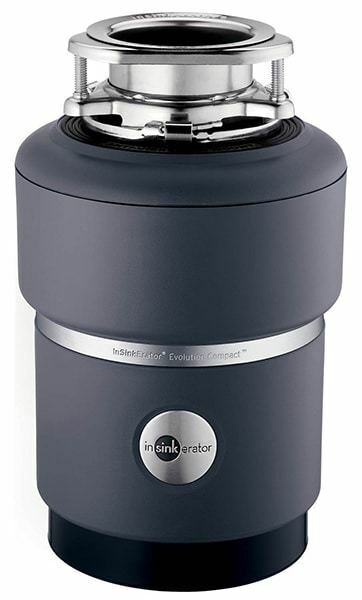 Unlike other disposer models, this one comes with a power cord. This Whirlpool garbage disposal is on the louder side. If noise is a consideration, you might want to look at one of the other models listed here. It only runs at 1/3 horsepower, making it one of the slower models that we’ve reviewed. Another of the best Whirlpool garbage disposals, the GC2000XE is one model up from the previous unit that we reviewed. This means that it’s slightly more powerful and has some additional features that the GC1000XE does not. 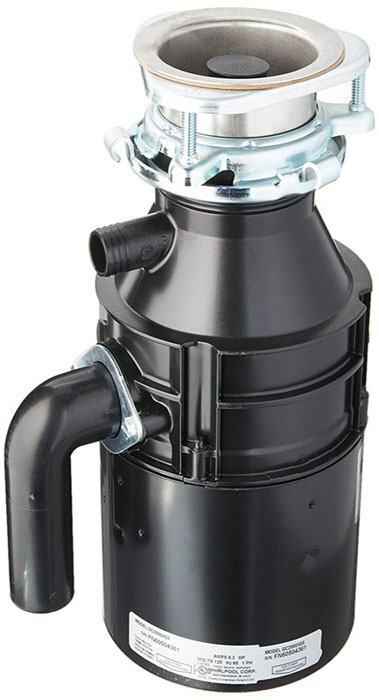 This whirlpool garbage disposal is just as easy to install, and it comes with everything that you need to get it up and running, with the exception of an electrical plug. 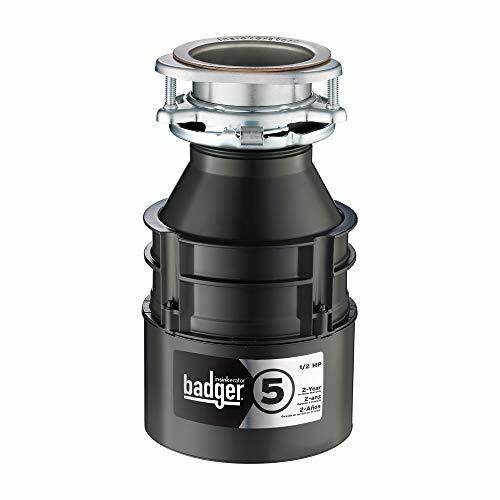 This Whirlpool garbage disposal comes with a galvanized steel sink flange, as well as a grinding wheel and shredder flange made of the same material. What does this mean? It’s a very powerful machine. This disposal has ½ horsepower motor, making it stronger than the previous model. The food waste grind that results from the 13.34-pound device definitely won’t clog your pipes. On top of that, the GC2000XE is noticeably quiet. However, it is fairly long – it is 14.7 inches long by 7.5 inches wide and 7.5 inches deep. The powerful ½ horsepower motor will take care of many different types of food waste. This Whirlpool garbage disposal is made mainly of galvanized steel. It’s easy to install and connect to your current plumbing and sink. The continuous feed grind ensures that food won’t rot in your disposal before you have enough to run it. The grind chamber housing is prone to cracking as the device ages. At 13.34 pounds, it’s slightly heavier than similar disposals. The Whirlpool GC2000XE does not come with an electrical plug. It is noticeably larger than the GC1000XE. When it comes to the best Whirlpool garbage disposals on the market, you really can’t go wrong with the Whirlpool GC2000PE. Not to be confused with the similarly-named model above, this disposer runs son 115 volts of power. It also has a ½ horsepower motor and only weighs 13 pounds. It’s also very quiet and comes in black with steel accents. You won’t be disappointed with this garbage disposal. It’s one of the best out there. 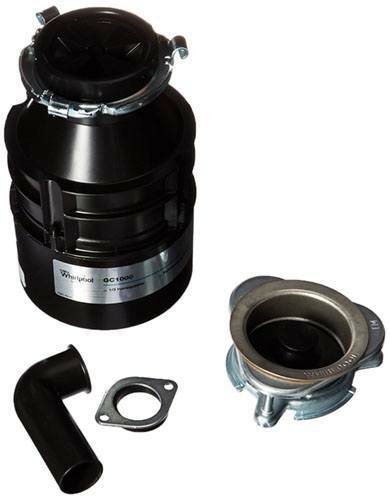 The Whirlpool GC2000PE is a very quiet disposer. It comes with everything that you need to install it, including an electrical plug and a dishwasher drain connector. This additional feature makes it best for people who have a complicated plumbing set up in their kitchens. Many people with a dishwasher need to be careful when choosing a disposal, as they need one that will work with it. With that said, the GC2000PE isn’t exactly the smallest model available. It measures 7.5 inches deep by 7.5 inches long by 14.5 inches long. This depth makes it tricky to fit underneath some sinks, especially if you have a small kitchen. 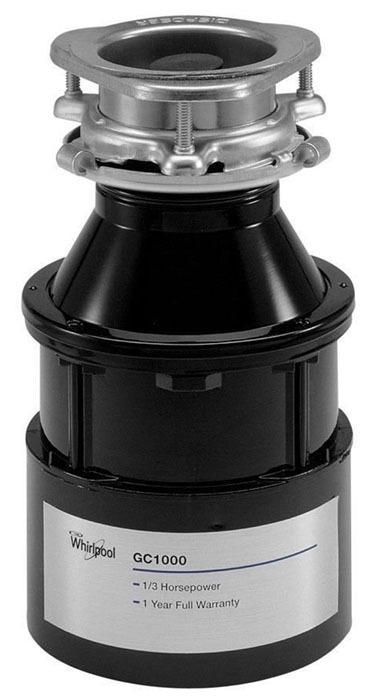 This Whirlpool garbage disposal only uses 115 volts of power. This means that it won’t cost you a lot of money to run. It’s a continuous grind model, which many people prefer over a batch feed one. The GC2000PE comes with something that the XE model (reviewed above) lacks – an electrical plug. This device is extremely quiet – the quietest of the Whirlpool models that we’ve reviewed. This disposal is on the longer side, meaning that it won’t fit beneath some sinks. Some users have experienced shaking and vibrations when the machine is in use. The three models described here are the best Whirlpool garbage disposals on the market. We carefully reviewed them in order to help consumers like you choose the model that best fits your needs. Whether you want a powerful machine, one that is made of galvanized steel parts, or even one that’s as quiet as possible, you can’t go wrong with any of these three Whirlpool disposals.